Home / FAQ – How to use Autodtc.net? 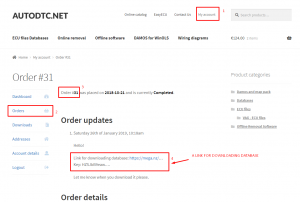 How to buy ECU files database? Open online catalog of Ecu files database. Select one or several databases from the list and add it to basket. View your basket. Apply coupon code if you have it. Push the button “Proceed to checkout”. Log in to our Autodtc.net account or filling “Billing details”. Read and agree to the website terms and conditions. Go to payment – by button “Pay by card” or “Proceed to PayPal”. You’ll receive links for downloading ECU files database after payment in 1 – 24 hours. 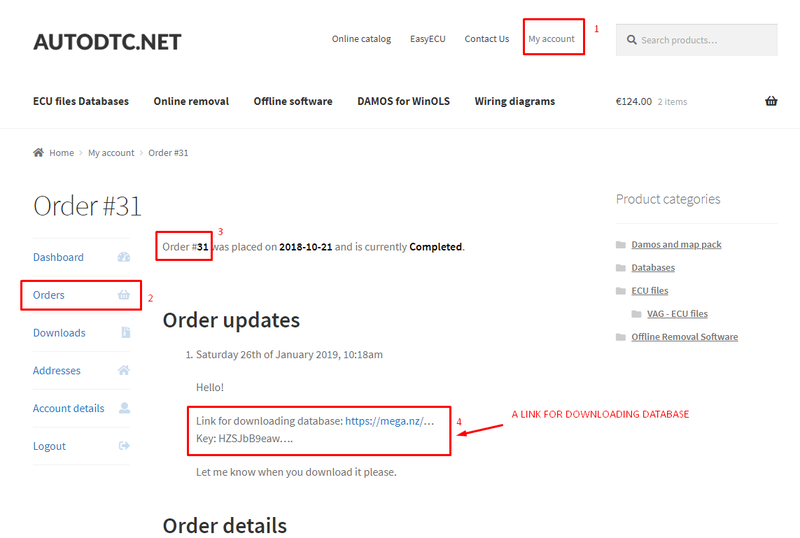 How to get a link for downloading my database? You’ll receive a link and key for downloading a database to your email in 1 – 24 hours. Also you can receive links in your personal account on Autodtc.net. Select your order by “View”. You can copy a link in “Order updates” paragraph. How to disable DTC, DPF/FAP, EGR online? Autodtc.net: you can send online request for removing EGR, DPF, DTC, Flaps, Speed limiter, IMMO, AdBlue and many other. Just filling the form on main page of Autodtc.net. 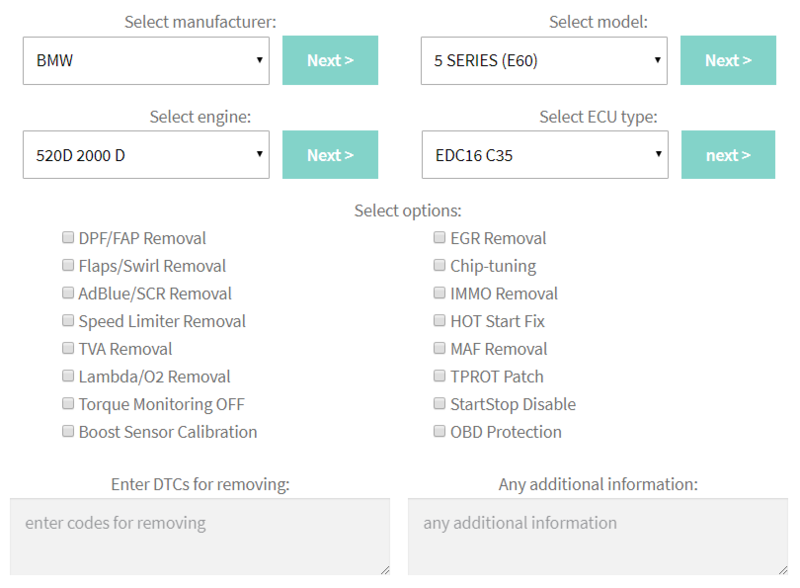 EasyEcu.com: remove DTC, EGR, DPF and Flap online. You can download your file immediately after the payment. No need to wait. You can disable for free any additional DTC after payment. What is a "request" on Autodtc.net? You can order modifying of ECU files online. Just filling the form on main Autodtc.net page and send a “request” to our specialists. Online Card Payments: MasterCard, VISA. This online payment provided by EveryPay AS Kalasadama 4 10415 Tallinn Estonia Company. PayPal. Pay for goods using your PayPal account. How can I download ECU files, database, diagrams and other? Downloading files from autodtc.net right after a payment. It’s usually small files. Downloading from external souses. You’ll receive a link and key for downloading big database in 1-24 hours after payment. File for online request on Autodtc.net client receives by e-mail from admin@autodtc.net. Can you help me with my coupon? Type or copy and paste the coupon code into the ‘Coupon code’ box. Enter the code exactly as it was given to you, without any spaces. I have unused Tokens. What should I do? exchange tokens for discount promo-code on EasyEcu.com.